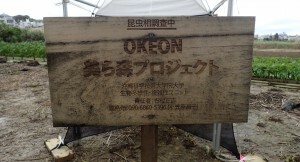 OKEON Churamori Project is a terrestrial environment monitoring system set up here in Okinawa, the most biologically diverse region in Japan, involving multiple institutions, local high schools and museums. It aims to gather data to monitor the environmental changes from hereon out. The first step is to set up 24 sites across Okinawa, and from there conduct a survey of arthropods.